Spark French manicure nails with a subtle silver or gold sparkle or give colored nails just that extra wow-factor! Glamour Gloss has superior high shine, is non-sticky after curing and is flexible. It has a guaranteed durability and prevention from fractures on top of any design. 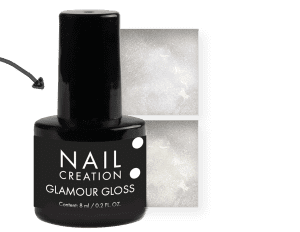 Glamour Gloss Silver and Glamour Gloss Gold have the same features as bestseller Glamour Gloss.